Seventh Star Press, LLC, 9781941706008, 269pp. Terrifying creatures exist all around us, hiding in plain sight. Ancient. Deadly. They gather in secret, conspiring, dreaming of nothing less than humanity's destruction, and their numbers are growing. Earl Preston knows the danger all too well. After tangling with a horde of mythological sea monsters in Colonial Bay, he has been tasked with finding these beasts and exposing their plans whatever they may be. But Earl is not the only one with a mystery on their hands. At the very top of the world, Carol Miyagi has stumbled onto an artifact from Earth's past, something magnificent held captive in a prison of ice and snow. Now, Carol and Earl must work quickly to decipher the will of the gods-a plot that defies imagination-and to stop their followers from carrying it out. They thought the nightmare was over, but they are about to discover that the horror has only just begun. 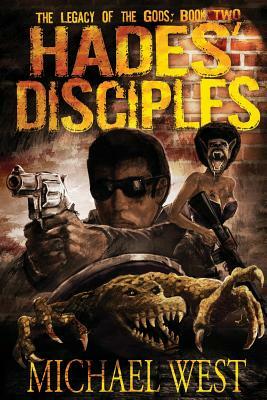 Hades' Disciples is Book Two of the Legacy of the Gods Series.